As regular BGR readers know, I have been an iPhone user ever since the first model was released back in 2007. I was using Nokia smartphones and BlackBerry handsets at the time, but I knew they were outclassed after spending just a few minutes with that first-generation iPhone. It really was a glimpse of the future, and we’re living in that future right now. For a period of time, I almost always carried an Android phone with me in addition to my main iPhone. This was due in part to the fact that I often review Android phones as part of my job, but it was also because there were so many great Android features that were nowhere to be found in iOS. Android of course still has plenty of capabilities that iOS does not, but gap has narrowed substantially in recent years and I never carry an Android phone anymore unless I’m reviewing it. When I discuss why I’m an iPhone user and not an Android users here on the site, there are two main reasons I tend to focus on at the top of my list. The first is the quality of the overall user experience, which remains immeasurably smoother and simpler on the iPhone, especially when you include all of the great integrations between iOS and macOS. The second is the third-party app ecosystem — the quality of apps and the consistency of the third-party app UX on iOS is still leaps and bounds better on iOS than it is on Android. But there are plenty of other reasons I’ll probably never jump ship to Android from the iPhone, and I was reminded of one of the biggest late last week. iOS 11 is far and away the most problematic version of iOS that Apple has released in years. In fact, it has so many problems that Apple reportedly ditched a bunch of new features from its upcoming iOS 12 update so that the company’s software engineers could focus more on refining existing experiences and less on creating new experiences. Bugs, RAM management issues, and even gaping security holes have popped up constantly since iOS 11 was released last September. The security issues that had been uncovered have obviously been fixed already though, and that’s because Apple releases updates directly to end users rather than through device manufacturers or wireless carriers. Apple’s iOS 11 software has been pretty bad. In the future, it’s possible that Apple will release a worse version of iOS that’s even more riddled with bugs and security issues. But however bad things get with Apple’s mobile software platform, you’ll never come across anything like the crazy malware that was just discovered on Android. In a post on its Securelist blog, Kaspersky Lab wrote about the discovered of a fascinating and terrifying new piece of Android malware that has been uncovered. It’s called “ZooPark” and it’s essentially an amalgamation of every scary malware you can think of. ZooPark can monitor keylogs and clipboard data, so it can steal sensitive data such as passwords, as noted by ZDNet. It can also swipe saved information such as contacts. ZooPark can capture the user’s screen at any time, it can steal photos, and it can even record video of the user’s screen while he or she uses an Android device. But wait, I’m not even finished yet. 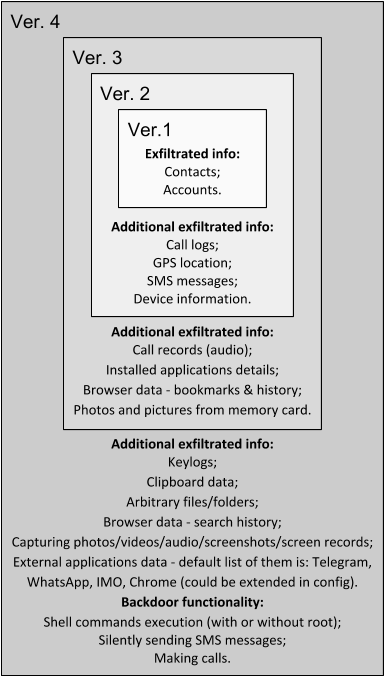 ZooPark can access call records or even record audio from phone calls made on an infected device. It can steal data from secure apps like WhatsApp and Telegram. It can force a front or rear camera to covertly capture photos or videos. Then without the user even knowing, it can make calls, send texts, or execute shell commands to transmit all the data and files it captures. This is quite literally the stuff of nightmares. A sophisticated piece of malware like this is impossible to achieve on the iPhone. Well, I shouldn’t say it’s impossible — technically, a hacker with physical access to your iPhone for a very long time could jailbreak it and install a ton of malware that achieves all or at least most of what ZooPark is capable of. This is a very unlikely scenario, however. It would be impossible for something with even 10 percent of ZooPark’s capabilities to be installed remotely on an iPhone because Apple walls off most of the phone’s core capabilities from third-party apps. Android users always complain about Apple’s “walled garden,” and in some ways their complaints are valid. That’s a big part of the reason why Apple has rolled out more and more APIs for developers over the years, giving them access to new background processes and integrations. But the level of access needed to pull off something like ZooPark will never exist in iOS, and it’s yet another big reason why I stick with the iPhone.